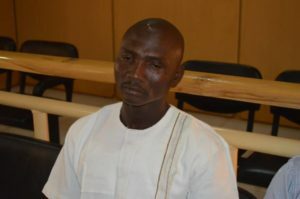 The Independent Corrupt Practices and Other Related Offences Commission (ICPC), has arraigned one Hassan Abdullahi Manga, before Honourable Abbas Ahman of Kebbi State High Court 3, sitting in Birnin Kebbi on a 2-count charge bordering on alleged forgery. Mr. Manga, a Principal Inspector with the Nigeria Security and Civil Defence Corps (NSCDC) serving in Niger State Command was accused of procuring and presenting a forged Nigeria Certificate in Education (NCE) Lower Credit, from Adamu Augie College of Education, Kebbi State, with which he used to secure employment with NSCDC in 2004. Trouble began to brew for the accused person when in 2016 the Honourable Minister of Interior, Abdulrahman Dambazau, upon the suspicion that forged certificates were presented by many officers of parastatals under the Ministry, wrote to ICPC to scrutinize the credentials of its personnel presented either at entry point or during the period of their service. The Commission immediately swung into action and its investigation revealed that the NCE presented by Mr. Manga before he was employed by NSCDC which he purportedly obtained in 2001 was forged as his name was not on the convocation list of that year. In a Charge No: KB/HC/17C/2018, counsel to ICPC, Maskur Salisu, averred that the defendant’s action was contrary to sections 363, and 366 and punishable under section 364 of the Penal Code Law. If he is found guilty, he is liable to 14 years imprisonment. The accused person entered a “not guilty” plea when the two charges preferred against him were read to him. His counsel, Hussaini Zakariya, prayed the court to grant his client bail which was not opposed by the prosecution counsel. He was granted bail in the sum of N2,000,000.00 and a surety in like sum who must possess a landed property within the jurisdiction of the court. The case has been adjourned to the 11th and 12th December, 2018 for hearing.